Get "Jamming" with this Bob Marley Double Mini Cell. 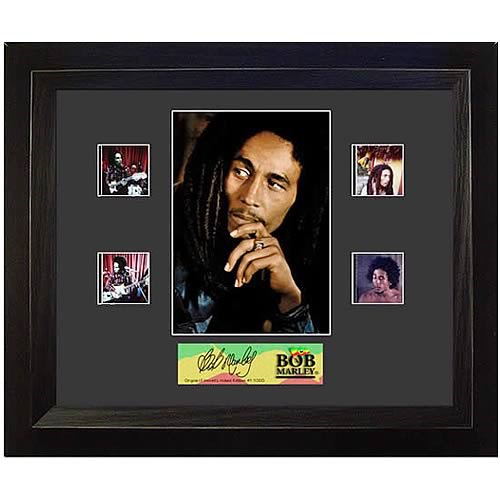 The film cell is a 8-inch by 10-inch print alongside four 35mm film clips and a Bob Marley name plate. Limited to only 1,000 in the world, this item comes in a beautiful black ash effect frame with a stunning sublimated plaque and certificate stating authenticity. Bob Marley was born 6 February 1945 in a small village called Nine Miles in the parish of St. Ann, Jamaica. His father was a white British Naval Officer named Norval Marley. Bob had only a scant recollection of his father. This was largely due to the fact that the 'well to do' Marley family did not approve of the relationship Norval had formed with Bobs mother Cedella. His father therefore, despite marrying Cedella, was more an occasional visitor. He did not live to witness the success of his son Bob. Bob cut his first record at the age of 16 in Kingston. A song called 'Judge Not'. In 1963 the original Wailers were formed, the line-up being Bob Marley, Bunny Livingstone (who was later to take the name Wailer), and Peter Tosh. Their first song 'Simmer Down' was an instant number one in Jamaica. The first album of the new line-up 'Natty Dread' was a major success. In 1975 Bob Marley and the Wailers played the Roxy in Los Angeles. Among the ectstatic audience (apparently some were dancing on the tables) were Beatles George and Ringo, Bob Dylan, and Jack Nicholson! Back home in Jamaica Bob was becoming revered as a mystic and prophet, his influence was noted by politicians. Bob intended to end his days back in Jamaica but was so ill that he had to check into a hospital in Miami where he died on 11 May 1981 from cancer.